Can we get a reason? I’m kinda using it usually. They banned my account, Rogue’s account, and many others. The files they flagged as violations on my account were things like 100% save game files and other completely innocuous stuff. Essentially, I woke up one day to find 3-4 violations in my e-mail and then a further e-mail informing me that my account was closed for too many violations. No reason for any of them, no notice, files gone. I wouldn’t trust mediafire with pictures of lolcats. So what? Will there not be a version to be added to MGQ3 as additional stories like it was for Breakfast? Nope. That was a lot of trouble and a bad idea overall. I’m not even sure if those side stories even still work properly. Yes they still work. I just played them all last night for memories. They just came out with a patch that helps alot of the old side stories work again on the MGQ wiki. Dropbox will block your account if there is too many downloads for your files. Had that when Rogue was losing his links to MGQ3 1.0 patch and I tried to help by uploading it there first. I have heared you are searching for YU-RIS engine tools? Since today i am working on one. So far it can extract all the files from .ypf. But the party is in the ybn files. I am working on them right now. Crass handles the .ypf files just fine. The encrypted .ybn ones are definitely the issue. it helped. With the key and file format it was easy to encrypt the files. so my translation tool is basicly finished. 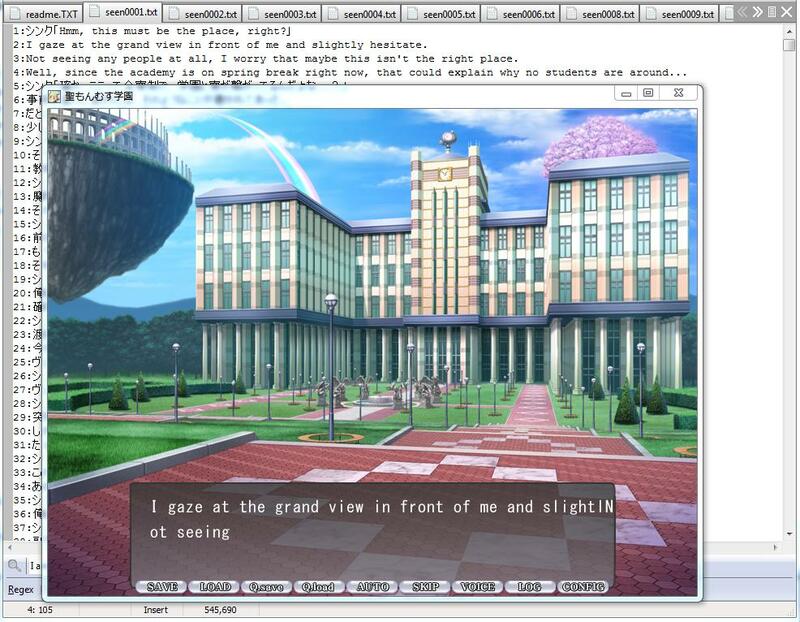 I also testet it a little bit with the game 聖もんむす学園 and it seems to work. But i cant tell if all text lines got exported. -changed characternames wont show up in the little box above the text. If it fails to extract the .ypf files you can use Crass to export them. It only needs the folder ysbin with all its files. If you have any problem let me know. Also about the game so i can test it. Awesome, I’ll give it a whirl. Wordwrap and the character nameplates are things that always have to be hacked to work. I know the Russians have translated some yu-ris games so perhaps they’ve done that hacking already, but that brings me back to the problem that I can’t get in contact with any of them. Hmm, I tested it with 聖もんむす学園 too and I seem to be having problems. Your program extracts everything fine I think (no seen0007.txt is worrying, but it wouldn’t be the first time a game skipped a number in their files). I tried to pack the original .ybn files with YSPac without even changing anything, but the game doesn’t seem to be able to read the repacked .ypf. It’s only different than the original ysbin.ypf by a few hundred bytes so I’m not sure what’s going on. The game simply pops up the licensing information when I try to start, which is the same thing that happens if you remove the ysbin.ypf file entirely. the game doesn´t care what version number the archive has. And for just repacking, filecount and headersize must be the same. You have to pack the folder ysbin, not every file. So only 1 entry in the list of YSPac. Thats what works for me. Yep, that works. The idea crossed my mind at some point, but I didn’t actually try it. Oops. It seems that sometimes the game engine discards the rest of a line and grabs text from the next line instead. The next line ends up working correctly, though. Character name export/import? Now inside. So they will show in the box if you change the name in both places. every text that starts and ends with ” needs them. But for word wrap i dont think the engine can do this. Simplest thing would be to add some spaces where they are needed if it will work. Maybe i make an automated way of handling that problem. and i fixed that problem. i managed to calculate offsets wrong so i overwrote some other text. Nice! You’re totally awesome for doing this so quickly. It is possible to change the Japanese quotation marks 「」 to regular ones “”? yes, but then characternames will not be shown in the box. Maybe i can find a way. They are the starting quotations. So you could change one that is not in use to “. Also changing things in said file now works. What i found out is that names have a script and a display name. So i could only change the display name and all the script files still work with the jap name. But that means that said file would need a reset. I think it will work just fine in the current form. I can’t get regular ” quotation marks to work as a starting quotation though. Special “ ones work (and other symbols), but those mess up the word wrap, maybe because they count as 2 bytes? Oh, and not to complain, but the text replacer is really slow after I’ve translated some lines in a file. 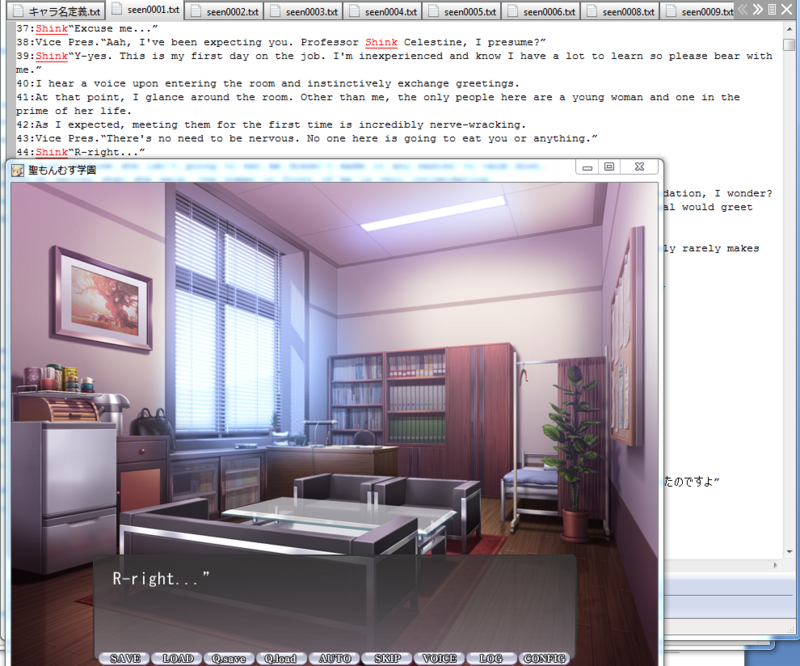 It’s not bad now, but I’m worried it could take hours after a few thousand lines are translated. I don’t know if it’s the wordwrap spacing algorithm or the quotation replacement. It was fast in the last version. I rewrote the complete texte replacement function and testet it with all lines. And now it is faster. For the wordwrap it is now slower because it has to calculate the size of the lines. Before that i was using the length of the text in characters. Also i didn´t account for the spacing the quotes have on the left side. The settings in the config file are good enough for now. But it should still be a speedup. Nice. It’s very fast now. 3rd line with a quotation is mis-aligned with the 2nd line. The first one seems to be an engine bug not having spacing on the 3rd line. Excellent! I think that covers everything. You’re a hero for doing this so quickly. I just like to see games getting translated. -only changed files will be processed. For speedup. I think I speak for the whole vore community when I say thank you very much Dargoth. So what now ? VH4 ? Hopefully, I see no one else doing it. Yes. Unfortunately or fortunately, Dargoth might be the only one interested in translating VH4. Haven’t found anyone else either.